Are you working with a licensed marketing provider? As a treatment provider or facility, you will want to ensure that you are working with only licensed companies to perform your marketing. We are proud to participate in this unique licensing program to demonstrate ethical marketing practices. This effort is a start towards eliminating drug and alcohol rehab patient brokers, middlemen lead generating websites, and phone rooms in Florida. 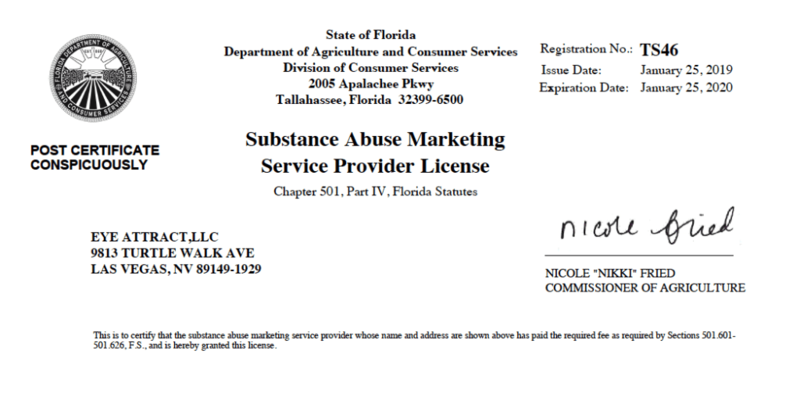 In addition to this license, we are proud to have been in business for the last 13 years. We are one of the only SEO agencies that is registered in multiple states, and carry proper business insurance to protect our clients. Don't trust your SEO and internet marketing to just anyone. With Coffee With Phil / Eye Attract, you can be sure that you're working with not only a knowledgeable and skilled team with over a decade of experience, but also a company that is serious about doing business the right way.